I had two long-sleeved t-shirts in my closet that I hated because they were both too short. I have a long torso, and like my shirts long besides, so it’s a constant problem for me. The thing is, I kept forgetting that I hated these shirts so I’d pull one of them out, put it on, remember the problem, and decide to just wear it anyway. I thought I’d grab them from the clean laundry and not stick them back in the closet. As you can imagine, I’d forget (again!) and hang them right back up. I broke the cycle! I have hooks on the back of my sewing room door where the future project clothes hang, and I finally managed to move them there. Sometimes things live there for a long time, but I just kept looking at those two shirts thinking they might work if they were combined into one. The first decision I had to make was which shirt to keep as the main color. I went with the green because it was in a little better condition than the blue. I very lazily held the shirt up to myself and estimated how much longer I’d like it to be. I highly recommend actually trying it on for this step. Fortunately, I guessed too long which is much easier to fix than too short. I cut off the amount of length I wanted to add to the green shirt from the blue shirt, plus one inch, which was 6 1/2” total. Since the sleeves weren’t too short, I just wanted to add a little of the blue, so I cut 2” from the bottom of each sleeve. Since the fabric didn’t unravel when I cut it, I didn’t finish any of the edges. I marked 1” from the edge on the blue so I would know where to overlap the green to. I overlapped and generously pinned all the way around the bottom and both sleeves. 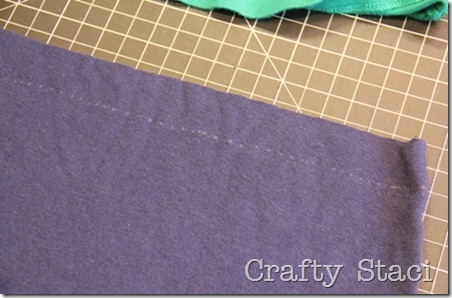 I used a narrow zigzag stitch to sew them together so it would still stretch. You might be thinking this looks a little weird. Well, it did. I tried it on and it was twice as long as it should be, so I folded the blue in half and stitched again. I could have stopped there, but that blue t-shirt carcass was laying on my table just begging to not get thrown in the trash. 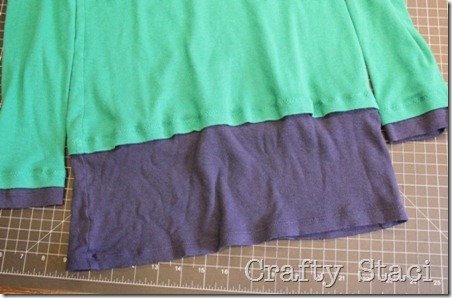 Starting from the bottom of the shirt, I cut off four 1” strips. I then cut off the side seams, so I was left with eight strips. I lined up a strip about 1/8” away from the top edge of the neckline and sewed a zigzag stitch down the middle, overlapping the strip back on top of itself about 1/2” as I went. When each strip ran out, I just started the next one where it left off. I was a little concerned this was going to make the neck too heavy and it would hang too low, but I tried it on and it fit just like before. …and sewed them together by overlapping them slightly and zigzagging. I wrapped the remaining strip I had around one section, tied it and tucked the tail under the knot. Infinity scarf! I have to admit, I was a little hesitant about mixing these two colors, but I’m happy with the result. Two shirts I couldn’t stand wearing turned into one I love with a bonus infinity scarf? Today was a win.